From ghostly worm eaten legs to theatrical pews Holy Trinity church in Wensley has all the rich ingredients for storytelling. 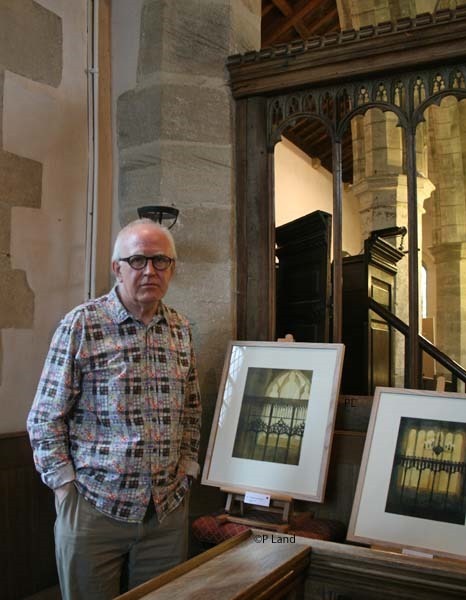 Which is why this summer Ian Scott Massie chose Wensley church on the A684 in mid Wensleydale for his exhibition of paintings and prints entitled Tales of the Dales. Nothing illustrates this more than the enduring story about the plaque in memory of Peter Goldsmith MD. A few years ago a group of excited people rushed into the church on the anniversary of Nelson’s death to see this plaque as they believed Goldsmith was the surgeon with the admiral at the battle of Trafalgar in October 1805. She learnt that in the past the rectors had so many churches that they would send curates to take services for them. The curates were not well paid and had to find cheap accommodation. And what was cheaper than turning the upper part of the vestry into a bedroom! “And why do we get people married on the blue stone?” she wondered – and added: “You also get buried from the blue stone unless you are Lord Bolton and then you go up into the chancel.” The blue stone commemorates two 15th century rectors at Wensley – the brothers Richard and John Clederow. The traditions involving the blue stone date back over 100 years but no-one knows when they started or why. Above: The blue stone is in the centre foreground. 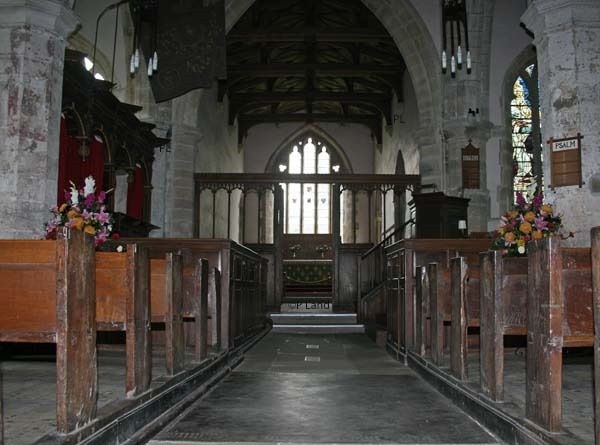 On the left is one of the pillars on which there are the remnants of medieval paintings, and then the Powlett Pews – see below. One of Penny’s enduring memories is of Richard Lord Bolton’s funeral in August 2001. This was attended by three retired clergy. So the officiating minister used the Bishop’s chair while the other clergy sat in the triple Early English style stone sedilia (below). “I thought you probably would never see that again. I like the sedilia – I think they are very beautiful,” she said. Another beautiful feature of the church is the medieval screen with its heraldic carving illustrating the various alliances of the Scrope family. But Penny wondered how did that and the reliquary, said to contain relics of St Agatha, come to be in Holy Trinity church. These were at St Agatha’s Abbey at Easby near Richmond until the monasteries were dissolved by Henry VIII in the 16th century. The Barons Scrope of Bolton in Wensleydale had close links with that abbey from the 14th century. The present Lord Bolton (Harry) is descended from Thomas Orde-Powlett, the 1st Baron Bolton, whose peerage was created in 1797 and who was a descendant of the last Baron Scrope of Bolton. Harry does not know exactly how the screen and reliquary came to Wensley but commented: “I have always assumed that as Patrons of Easby (the Lords Bolton) either brought ‘The Screen’ or the salvage rights at the time of the dissolution and moved the screen to Wensley, of which they were also Patrons.” They were also the Lords of the Manor with their castle (Bolton Castle) nearby. He believes that the folly called Polly Peachum tower which can be seen from Wensley church pre-dated the installation of the pews and isn’t convinced about the story that “Polly” went there to sing so as not to disturb her husband. 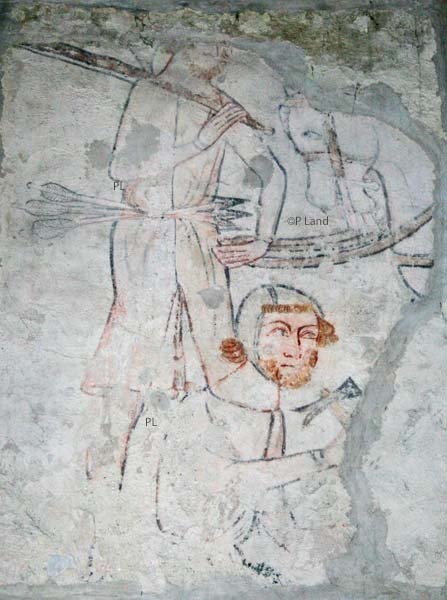 Left: remnant of a medieval mural still visible on the north wall. To him as a historian Wensley church has a fabulous history. There are the medieval wall paintings including one of the oldest surviving depictions of the legend of the Three Living and the Three Dead, complete with worms hanging from decomposing legs. In this story three dead people return to beg those who are still living to repent – for in death all are equal. But as Penny pointed out at Wensley there is a sad reminder that not always were the dead seen as equal. 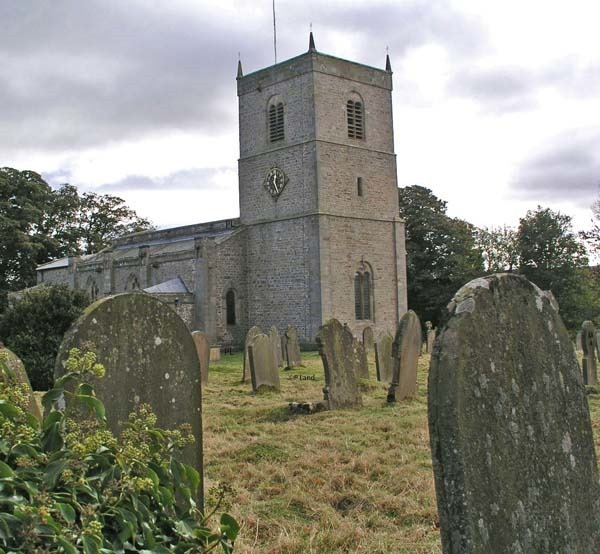 For when the village was ravaged by the plague in 1563 those who died were not buried in the churchyard but in pits directly west of the church still visible as pale areas of grass on the north bank of the River Ure. Inside the church there are many reminders that even if death was a great leveller the rich could pay to be remembered. Just beyond the 16th century carved oak stalls and in front of the communion table is a superb Flemish brass – but for a long time no-one knew who had paid for such a splendid memorial. The small inscription states that Oswald Dykes, a rector at Wensley in the 17th century, was interred there. It was the Rev James Raine2 in the mid-1850s who solved the puzzle of who was the first occupant of that grave. For Dykes had requested in his will that he should be interred under the stone where “Sir Symond Wenslow was buried”. Sir Symond Wenslow was Sir Simon de Wenslegh upon whom the valuable and important rectory of Wensley was conferred by the Scrope family in the 14th century. For Penny, however, there is at least one very modern puzzle to solve. Why has the congregation grown from nine to about 35 since the church was made redundant in 2006 even though the faithful regulars stick to using the traditional Book of Common Prayer (BCP)? Only six services can be held there each year now that it is cared for the Churches Conservation Trust. 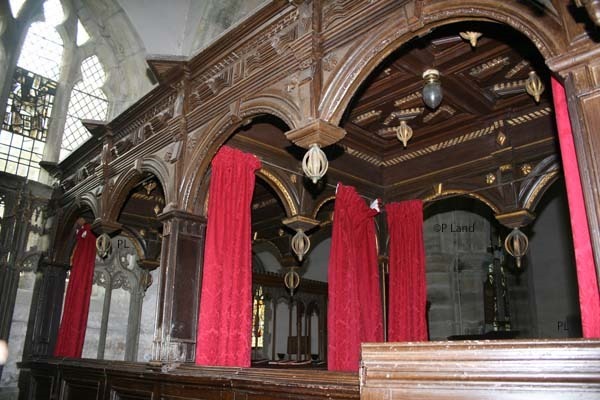 “As far as I am concerned the Churches Conservation Trust is absolutely brilliant. They have spent thousands on this church and completely re-roofed the tower. They are all so kind – and you are kept informed,” Penny said. The church is still very much part of the community with events like the biannual flower festival, christenings, weddings and funerals being held there. So if you are passing through Wensleydale take time to stop at Wensley and visit Holy Trinity and see which stories you want to weave around the history of this fascinating church. And also take time to enjoy the footpaths through the large Bolton Hall estate with its wonderful vistas across the dale. 1. The first run of The Beggar’s Opera began at Lincoln’s Inn Fields Theatre in January 1728. This theatre was abandoned in 1732 when the new Covent Garden Theatre was opened (Wikipedia). 2. Notice of a Remarkable Sepulchral Brass of Flemish Design, in the church of Wensley, Yorkshire, by Rev James Raine, principal of Neville College, Newcastle upon Tyne, published in The Archaeological Journal, vol 12 in 1855. He stated that the brass “represents an ecclesiastic with a chalice and the host laid upon his breast. 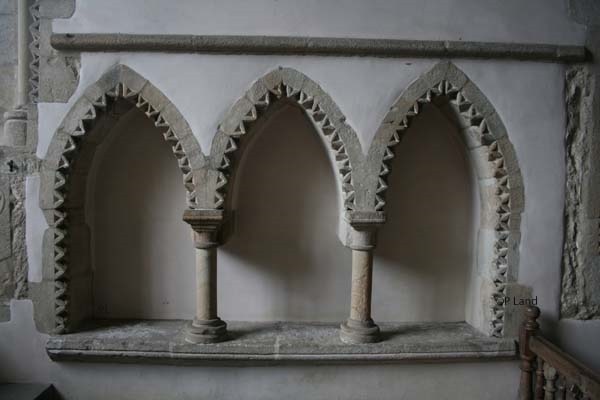 The priestly vestments are most beautifully executed…” Raine noted that as so many wanted to be interred in churches this was not unusual and that altar tombs and stone coffins appeared to be used again “without the slightest scruple”. 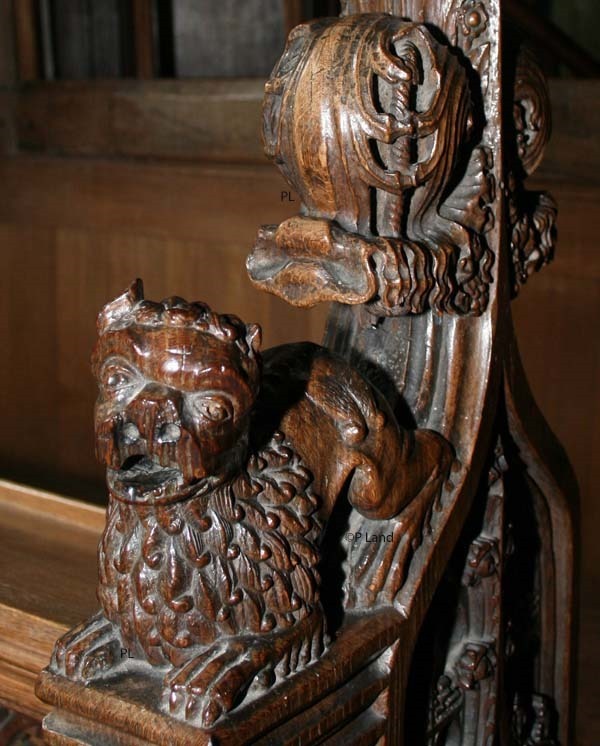 Above: One of the fascinating animals to be found on the 16th century oak stalls in the church. Below: Scott Massie at Wensley Church in August. Scott Massie’s exhibition Tales of the Dales can be viewed until January 5, 2014, at Farfield Mill which is on the A684 between Hawes and Sedbergh. It is also possible to buy copies of his book which combines magnificent pictures with fascinating stories. These range from legends about saints, witches and fairies to forbidden tracks and haunted ravines. Definitely an unusual guide to the Yorkshire Dales! My Daughter Michelle was baptised in this beautiful church in 1983, I was working for Pip and Harry as their Nanny, I loved the family very much, and sadly lost touch with them, I recently read a short article that Pip had sadly passed away from a short illness, and am trying to find out more information. I remember her for her kindness, and her many talents!….the wonderful Stilton soup, and chocolate moose all of which made a lasting impresshion, I should love to find any pics of Harry, Thomas and Ben, I am not quite sure where to look!…….Gail Fitzgerald now in USA. found at whisperers456@Yahoo.com.